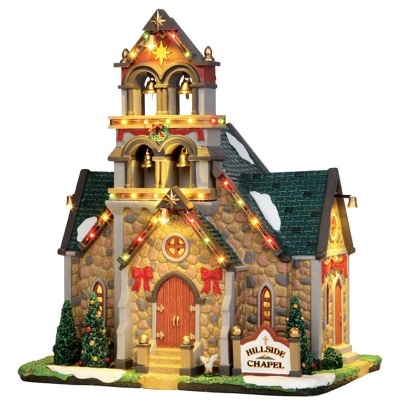 Lemax Hillside Bell Chapel Lighted Building depicts a snowed village community chapel delightfully dressed up in celebration at Christmas time. Internally and externally illuminated, Hillside Bell Chapel is a miniature table piece suitable for placement within a themed Lemax display. Hillside Bell Chapel recently joined the Lemax Caddington Village miniatures collection in 2014. Hillside Bell Chapel is a single porcelain hand painted miniature building on a single snowed base supplied with AC Mains adapter. Excellent product well made and definitely a must buy if you are a Lemax enthusiast. The lights on the building are bright and colourful. Well happy.